Attention: we are talking about a chocolate filling, with drops of caramel and a lick of cinnamon butter on top. If that doesn’t sound like a dream, we don’t know what does. 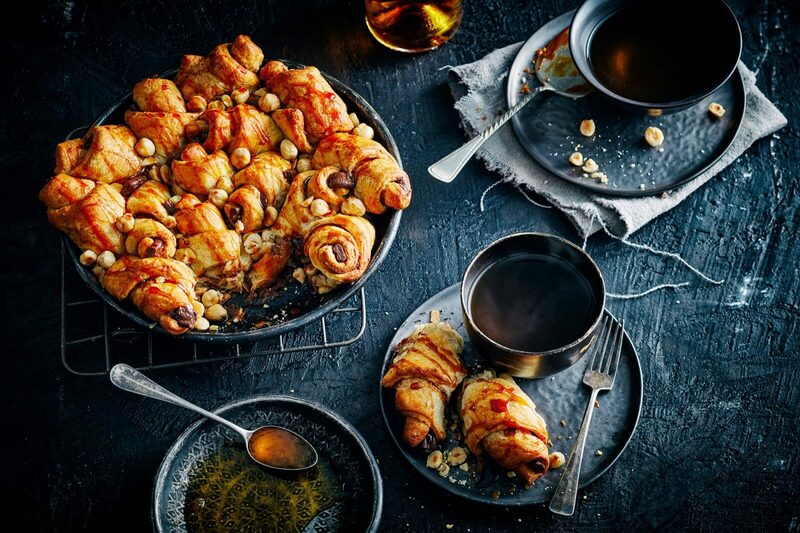 Feeling like a simple way to treat yourself, try the Choc-‘n-rolls! Buttercup a spring shape of 20cm. Mix the butter and cinnamon well together. Remove the dough from the package and grease the eight slices with the cinnamon butter. Put two chocosticks on each slice of dough and roll it loosely and slightly. Bake the cinnamon sandwich in the oven for 25-30 minutes. Take them out 5 minutes before they are done and sprinkle the hazelnuts over them. Then put them back in the oven. In the meantime, make caramel sauce by heating the syrup and cream in a saucepan. Be careful not to cook the sauce, it just has to be warm. When they are finished, take the cinnamon sandwiches out of the oven and pour the caramel sauce over them.